2017 has seen big releases of some of the best smartphones ever! With a tough competition and close specs to many of the leading phones out there, it’s the customers market. Vivo V7 needs no introduction as it was released after the succession of Vivo V7+. The Chinese handset makers have pushed for similar features and specifications than that of the Vivo V7+. The Vivo V7 comes with a smaller display, battery and half of the storage space than its predecessor. What you get – V7, XE100 with Remote and Mic, Documentation, microUSB to USB Cable, USB Power Adapter, SIM Ejector, Protective Case, Protective Film (applied). Sleek and lightweight, and looks identical to the V7+. The body has been treated to look metallic, in spite of being plastic. The V7, looks trendy with a 18:9 aspect ratio, a much larger 5,7 inch display as compared to its competitors.It, measures 149.3×72.8×7.9mm, and weighs 139 grams. I felt it was easier to hold in the palm of my hand, and maneuver one-handed! It comes in Champagne Gold, Matte Black, Energetic Blue. I quite like the light golden shin, gives it a bit of style and smart to look at. I am keen to get a hold of the electric blue as its more bold and with 2018 looking at more bright colours it should be the next best product to hold! As far as software is concerned, it has Funtouch OS 3.2, based on Android 7.1(Nougat), offering a more smarter user experience. The phone runs on Qualcomm Octa-core Snapdragon 450 (4GB of RAM). The offerings of 1.8GHz frequency offers more power than previous processors, providing for a more smoother and faster performance. The 32GB storage can easily be expanded to 256GB. For those looking to store precious images and videos this works wonders when on the move! Vivo V7 includes 4G VoLTE, Wi-Fi, Bluetooth v4.2, GPS/ A-GPS, Micro-USB, and FM radio. The sensors include accelerometer, ambient light sensor, digital compass, proximity sensor, and virtual gyroscope. This is the icing on the cake, Vivo V7 holds enough juice with excessive usage with 3000 mAh battery. Being a blogger I am always updating and editing images and videos, and lasts much longer before I have to get a full recharge, lasting a day. With non usage it lasts up to 2 days. Here are the highlighted features of the front camera – Face Beauty, Videos, Voice, Touch, Palm, Gender Detection, Mirrored Selfie, Photo Water, Portrait Mode, Group Selfie, HDR, Camera Filter, soft light flash. Face Access and Smarter Locking – This new feature scans multiple areas of the face, just pick the phone to wake the screen and it gets unlocked immediately. I tried it with glasses and without and had a bit of a problem. So ensure to have your pin or finger access ready to unlock in such case. How does the V7 fare? It’s pretty fast, and I had no issues issues related to the device heating up despite prolonged usage. The phone works and lag-free in spite of having multiple apps running at the background. 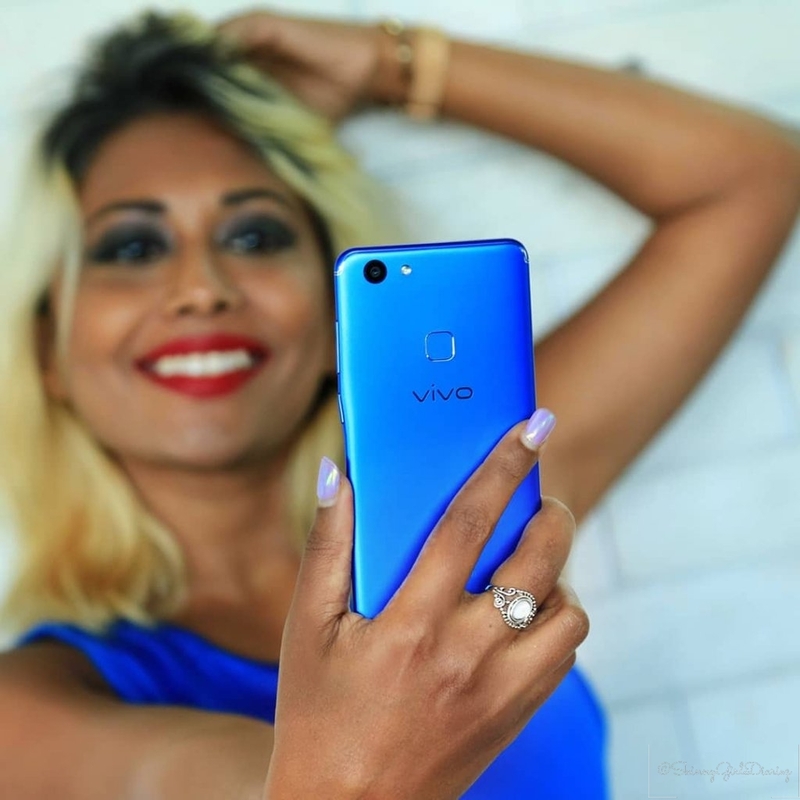 Vivo has set the advantage and been successful solely on the camera quality and balanced output. For a price tag of Rs 19,990, the device is a great choice for selfie-lovers. You can chose the level of Beauty and edit images with relevant filters to give your features and images a more glamorous look. **Disclaimer: verdict and views expressed about the phone are my own.